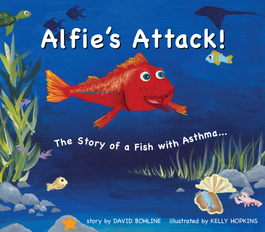 Why does a children's book about asthma have a fish as the main character? Partly because trying to breath during an asthma flare-up can seem like your lungs are full of water. Partly because a fish out of water does a good job of showing how distressing it is to have trouble breathing. But mainly because this fish tale has become a powerful tool for teaching asthmatic children how to prepare for, and react to, an asthma attack. Asthma is a serious condition which requires ongoing medical attention and, in severe cases, emergency care and treatment. As with all such conditions, information is the key --- knowing what it is, what to expect, and how to respond. If requested on the order page, your book will come with a strip of stickers showing scenes and characters from the story. These stickers are meant to personalize and decorate your child's inhaler, and also to serve as a reminder of how Alfie --- and your child --- has the knowledge and confidence to manage asthma effectively.